We are not against a new hospital, just a downtown hospital. Learn why Here. WARNING: Downtown Utica's Columbia-Lafayette Streets Neighborhood To Be Bulldozed! #NoHospitalDowntown will not allow this destruction of Downtown Utica. We have pledged to support property and business owners, as well as Utica-area residents who do not want this concept implemented. The 2014 Albany-based legislation that brings $300M of taxpayer money to Utica (see link and or excerpt below) is tied to a hospital to be built in "Oneida County". Local media more recently reported this new hospital will be built in downtown Utica on 34 acres that needs to be acquired- as the hospital does not own any land there. This would start work on a 4th hospital location and construction could only begin after blocks-and-blocks of downtown buildings are demolished. These blocks will go from being “taxable property” to “tax exempt” further shrinking Utica’s tax base. The MVHS’s Board of Directors voted to place the hospital downtown as their 1st Choice after allegedly considering 12 locations. A Utica newspaper offered a footprint, reporting a 34-acre hospital parcel, but the site measures only 12.5 acres by #NoHospitalDowntown. Businesses (30+) in that area, as did the residents of Utica, only learned about this project (and the Albany-based legislation) from a newspaper headline- we feel that is wrong. #NoHospitalDowntown opposes bulldozing downtown and seeks to keep the hospital expansion at the St. Luke's campus. 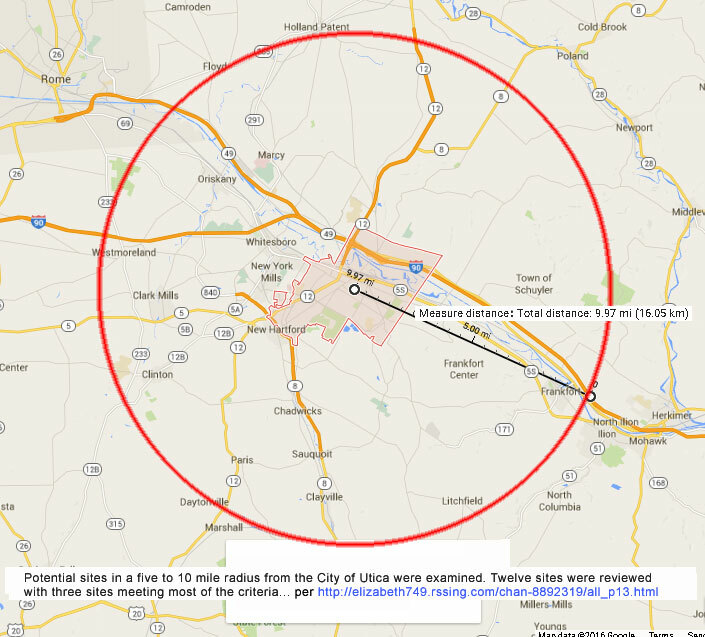 If the hospital has to be within the City of Utica, why did they look so far away? It was reported, "Twelve sites were reviewed with three sites meeting most of the criteria." What was the third site, as well as all the others? The Legislative Bill (S 2825-B): "ONEIDA COUNTY HEALTH CARE FACILITY TRANSFORMATION PROGRAM: ONEIDA COUNTY PROJECT. 1. AN ONEIDA COUNTY HEALTH CARE FACILITY TRANSFORMATION PROGRAM IS HEREBY ESTABLISHED UNDER THE JOINT ADMINISTRATION OF THE COMMISSIONER AND THE PRESIDENT OF THE DORMITORY AUTHORITY OF THE STATE OF NEW YORK (slush fund for pork barrel spending) FOR THE PURPOSE OF STRENGTHENING AND PROTECTING CONTINUED ACCESS TO HEALTH CARE SERVICES IN COMMUNITIES..."
We are not opposed to a new hospital, just the location. Read all the Voices who agree with us.